It must have been around 1976, a few years after we had settled into The Old Dairy. We had been checked out, evaluated and in town long enough and been seen to be trying to do right by the land and thus we were assigned our place in the community. The pantry shelves had not yet become cupboards but the old kitchen sink was installed in the tack room. A bench and a picnic table were nestled into that kitchen space now turned into a ‘nook’. The bench and table wood was new and shiny and must have been purchased in a rebellious extravagant moment. The benches are long removed, one has disappeared all together while the other has become the ‘back-door-boot-bench’. The table remains, now taking center stage in a proper sized farm kitchen. Here we break bread and ponder the woes and joys of our family and community lives. But then, in the second half of the 1970’s, these ruminations all took place in the nook. Jess must have waited and thought about it for awhile. Maybe it was while mulling over his predicament with a cup of coffee and his know-everybody-and-their-business sister-in-law Lydia that she suggested, ‘Try Aggie, down at the Peter’s place.’ For it was still too early to be known as Blackberry Farm, the name we had given The Old Dairy when we arrived. Jess, like many old ranchers of Sonoma and Marin had a little side line in horses. Working ranch quarter horses were mostly home bred but sometimes one could get lucky and dabble in a little thoroughbred breeding for the track. Heck, it didn’t cost much and was a little more fun than raising the steers for market. But the young colts and fillies had to be registered before they were yearling. This could pose a problem for the old cowboys of Santa Rosa and ranchers of Marin and Sonoma. Most of them had dipped into grade school but many had slipped out when fathers with ranch chores needed help. 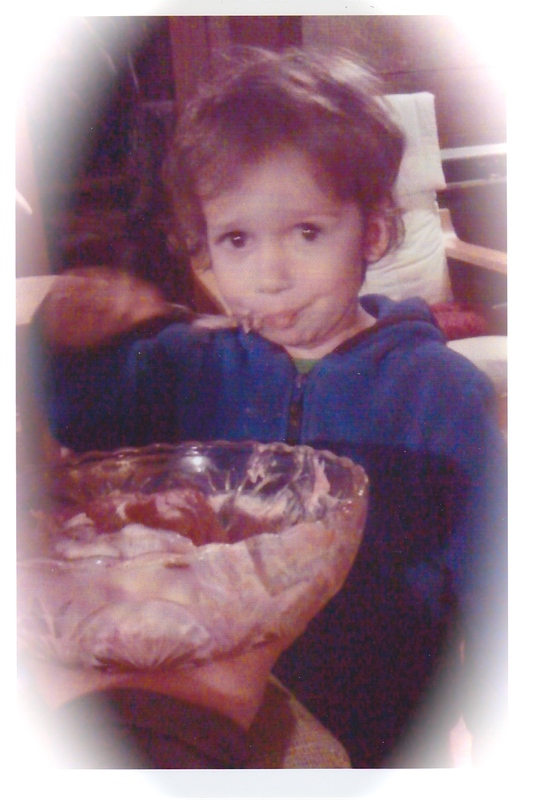 It may have been thus for Jess. Then, as now, the extent of one’s book learning ever needs to be kept a secret from ones increasingly educated children. Parents then were frustrated and resented, as much as we do now, having to admit our failings with the written word and computer technology. It was mid-afternoon when the old green chevy truck pulled up in the driveway. At first I didn’t recognize Jess, mostly because he was rarely seen off the ranch or out of his truck. He knocked, as we all do, on the back door. What did he say in greeting? I don’t remember, the usual, ‘Howdy,’ I expect before we sat down at the table in the nook. Jess reached into the inside pocket of his worn, thick Levi jacket and produced the crumbled forms he needed to fill out in order to register the yearlings. The forms were easy for me, simple and straightforward like a birth certificate should be. Jess had chosen names for the yearlings that we wrote down. The job was soon done and I handed the forms back to Jess. He nodded his thanks and we took a little longer, lingering over a cup of coffee, to talk of breeding, the weather and crops before he rose to leave. I didn’t see him again until 1995 at Mary Magdalene Church when he tolled the tower bell calling Lydia home to rest. Since that time forms have become a growing crop for farmers.As organic farming becomes a business there are organizations to monitor and check up on us, our fields and our crops. Like most busy country people my forms get shuffled about and sometimes misplaced so that due dates come rushing towards me. Now I’ve opened the envelope to another one. The due date, May 7th is past. But I still don’t know or understand what the form is for, why it is necessary or what they want from me. Where to, and where not to, fill it out? I’ve been thinking about it for too many days now. Maybe it is time for me to get on my bike, ride down the road, and check in with the young farmer by the creek. He seems to know what he is doing. Time to get on my bike to the young farmer down the road. Sorrel growing in the garden. 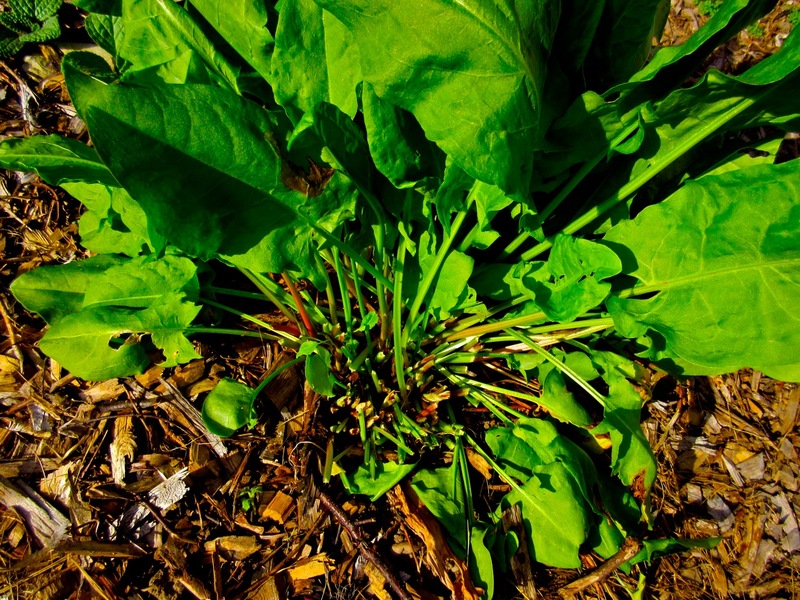 Sorrel is an early, easy leafy green vegetable to plant in the perennial vegetable garden. Garden sorrel or Rumex Acetosa and French Sorrel Rumex Scutatus both have a tangy lemon flavour. I’m not sure which one I am growing but it may be the French because of its pointed leaves. Sorrel looks like its weedy first cousin wild Dock but is a brighter, springier green. They all look a bit scruffy but are equally useful. Sorrel for soup and salad and Dock (with a bit of spit) to calm a stinging nettle rash when you are out walking. This recipe is adapted from one given to me by my friend Creta Pullen. Creta, her husband Bill, and their two very enthusiastic dogs run Ocean Song Retreat Bed and Breakfast. Creta is an outrageous cook and always concocting something new. It was Creta who gave me my Sorrel starts. Blended sorrel soup on the stove. Cut a bunch/handful of Sorrel. Wash and sort it and set it in a jar until you are ready to use it. Sauté a chopped onion or leek or shallot in olive oil. Today I added a little fresh chopped ginger and some turmeric and 4 bay leaves. Now add these to the onions and stir some more. Any white wine in the fridge? A glug or two can go in now. After the wine is absorbed add your home made chicken or vegetable stock. (There will be more on making stock later). Ready to serve sorrel soup with a hard boiled egg. Let it all cook up gently until the carrots and potatoes are tender. Strip the sorrel leaves from their stems and roughly cut up the leaves. While the stock cools do something else (lay the table, boil an egg or two). Fish out the bay leaves and put them in the compost. Now with whatever blender technique you use, blend the soup and sorrel leaves together. Return to the pot and adjust the seasoning. I add a little pepper here but no salt. Now it is time to add your own favorites. A little milk or cream or butter will soften the flavor. Tonight I made soft boiled eggs. Some warm French bread, a glass of wine and supper is yours and goes down a treat. This recipe first appeared in The Times in an article by Olwen Woodier in 1989 I think. Sometime later it was adapted from Mallards Restaurant at Arrowwood in Rye Brook, N.Y. When I found it again about 2010 I changed it a little – as you will too. Combine the rhubarb, strawberries and sugar in a heavy 2-quart saucepan and simmer for 20 minutes, until the rhubarb is soft. Pour 2/3 of the mixture into a blender with the kirsch; purée and set aside. Pour 4 tablespoons cold water into a small saucepan and sprinkle the gelatin over the top. Allow to soften for 10 minutes. Heat gently until the gelatin has completely dissolved. Stir into the rhubarb purée. 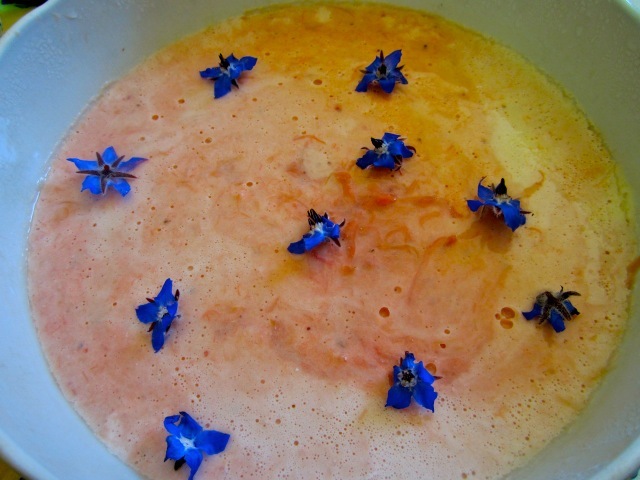 Whip the heavy cream until stiff and fold into the rhubarb mixture. Chill for several hours. Serves 8 to 10.